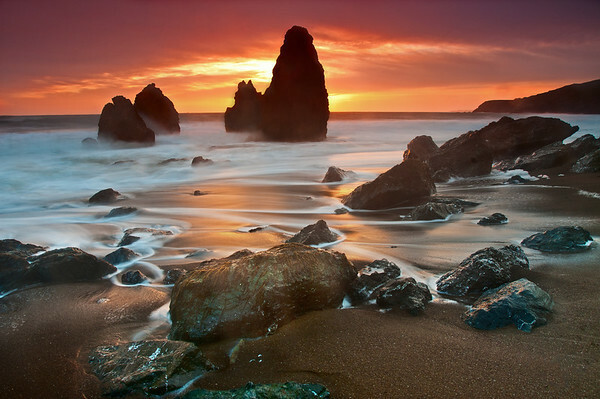 Sunset at Rodeo Beach Marin Headlands, California Last week my buddy and I grabbed our cameras, left work a bit early, and drove up to the Marin Headlands to take photos at Rodeo Beach. We knew these rock pillars were here and had seen some great photos of it and wanted to make our go. I've posted a couple other photos from this photoshoot but several of my friends really liked this photo so I had to throw this one up too! As soon as I threw on the my circular polarizer and the Graduated Filters the sky LIT UP! It was like an explosion of color! These photos are NOT HDR and have had very little saturation edits (in fact, I had to lower the saturation a bit so that you wouldn't think it was fake)! The clouds kept the sun hidden so I didn't have any clipping from a bright sun. The soft graduated filters worked great -- gave me some great color in the sky and let me slow the shutter for some neat wave movements. I'm quite pleased with how these came out! I've found that the motion of the outgoing wave makes for much nicer photos. I found a nice spot along the beach that wasn't getting too wet and used the rocks to create a line through the photo. I then used the fleeting water to create another line, away from it … trying to draw your eye in and to the right, then back and to the left. The awesome reflection of the sunset off the sand/water made this photo even nicer. Nikon D300s w/Nikkor 17-35mm f/2.8 ED-IF AF-S: 17mm, f/8, 8 sec, ISO 125, Tripod B+W F-Pro Circular Polarizer + Hitech 0.9 soft Reverse ND grad filter, Hitech 0.6 soft ND grad filter, and Lee FK Filter holder NO HDR. Decreased saturation in some areas (sky), added sharpening and some dodge/burning. WOW, one of your best ever!!!!!! !